There’s nothing worse than cold showers and the constant banging of an old water heater in the night. 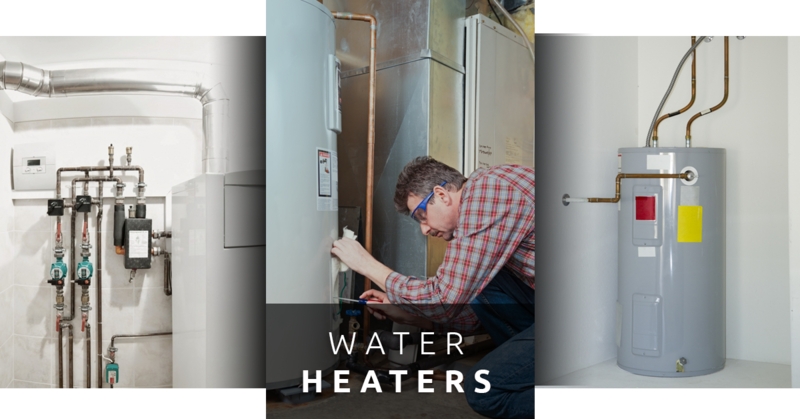 Once your water heater is tanked, here are a few common types of water heaters that could be a good fit in your home. A storage tank water heater is the most common water heater on the market, and is most likely the type of heater in your home. These heaters heat and store water in an insulated tank for later use. You can purchase an electric heater or natural gas heater. While electric heaters are initially cheaper to purchase upfront, they cost almost twice as much to operate and use more energy than natural gas heaters. Tankless water heaters are the most space-efficient heaters of the bunch, taking up a fraction of the space of storage tank water heaters. These heaters provide on-demand heated water, using coils to heat water as you need it. However, they provide limited hot water flow, so skip this option if you’re looking to run your dishwasher and take a shower simultaneously. Tankless heaters are great for those who use natural gas to heat water. But for those who use electricity, installing a tankless heater could be preceded by an expensive upgrade to the home’s electrical infrastructure. While refrigerators push warm air from inside the box to the outside air, heat pump hybrid water heaters pull warm air into the tank to be heated and stored. This process makes the heat pump hybrid heater almost 60 percent more efficient than a traditional storage tank water heater. These tanks are cost efficient as well, with a very quick payback time. Unfortunately, these tanks don’t operate in unseasonably cold spaces, so keep your hybrid heater in a space that stays between 40 and 90 degrees. Space can also be an issue with these heaters, as many of them stand over 7 feet tall. Solar water heaters are the most environmentally friendly option, with stellar efficiency in the summer months. These heaters incorporate a solar panel that absorbs the sun’s heat and uses it to heat the water—making the solar heater an excellent choice for those who live in hot, sunny climates. However, don’t expect great efficiency in cloudier, colder months, as these heaters will depend on a backup system when sunshine isn’t plentiful. Solar heaters are futuristic and kind to the earth, and can come with a federal tax credit. However, the upfront cost is big, meaning you could wait decades for payback on your investment. Condensing water heaters are perfect for those who use natural gas to heat water and need an exceptionally large water tank. This heater uses its own exhaust to generate heat, which makes it an efficient choice compared to a storage tank heater. If this heater fits with your water infrastructure and demand for hot water, then you’ll have a quality water heater, no matter how many appliances and people are using hot water in your home. If you’re looking to install a new water heater in your home, you need a trusted professional to get the job done. Emergency Plumbing & Solar are the most trusted plumbers in Honolulu, with experience in water heater installation and repair anywhere on Oahu. Contact us for your water heater needs today! Five Types of Water Heaters Overall rating: 5 out of 5 based on 10 reviews.